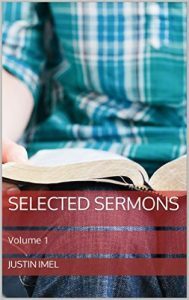 Selected Sermons | Kindle | 99¢ | Dr. Justin Imel, Sr.
As a preacher, you know that Sunday comes every week. As soon as you finish preaching one sermon, you need to begin preparing for the next. What if you had a resource—not to remove your own study for laziness—to help you prepare for Sunday? The sermons presented here are practical and preachable. They aim to stir your thoughts and help your study as you stand before God’s people to present divine truth. The lessons are presented in manuscript form to make them readable as well as practical. The lessons presented here are not only perfect for the preacher preparing his heart and mind for Sunday, but they are very suitable for personal devotion. May these lessons take you closer to God as you seek to honor him!